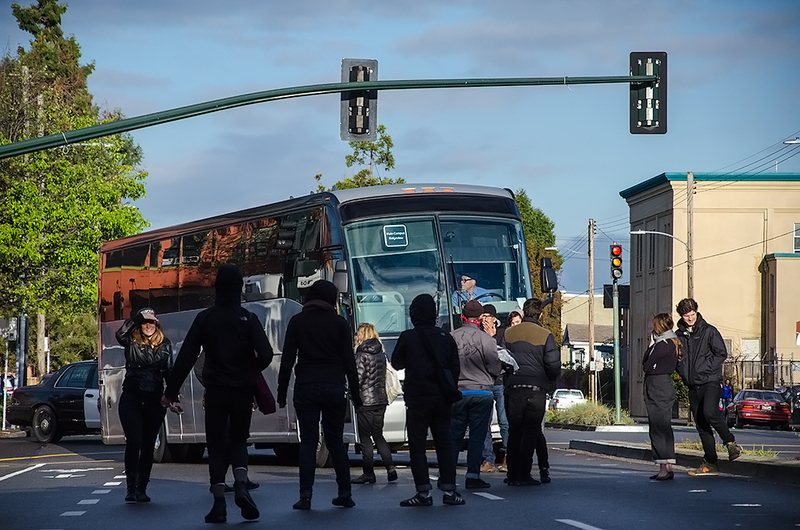 There is continued tension between tech companies trying to shuttle employees to Silicon Valley and the protesters fighting against the buses, with protesters saying the company buses take up space and interfere with normal commuters, along with hurt the environment. The Oakland Police Department and BART Police received calls reporting 15 to 20 protesters were becoming increasingly belligerent in their efforts to block a Yahoo shuttle bus. Major Silicon Valley companies - such as Apple, Yahoo, Google, and Genentech - have had their commuter shuttle buses blocked in San Francisco and Oakland. The problem only seems to be intensifying, with the companies trying to determine the best way to pick up employees from local ferry and transit systems without impeding on normal traffic flow. Earlier in the week, a San Francisco Board of Supervisors meeting voted to move ahead with an 18-month shuttle pilot program, despite a heavy amount of criticism regarding environmental concern.